Kā Pakitua is the name of the toki (adze) on the prow of the great migration waka Uruao. Uruao is the waka captained by Rākaihautū, the famed Ngāi Tahu ancestor who carved many of the geographic land forms of Te Waipounamu. On his voyage Rākaihautū raised Kā Pakitua and recited a karakia that cleared a passage across the ocean to Aotearoa. The name Kā Pakitua has been adopted by the Office of Te Rūnanga o Ngāi Tahu Senior Management Team as it symbolises the role the team will play, leading the organisation, as it traverses through chartered and unchartered waters. 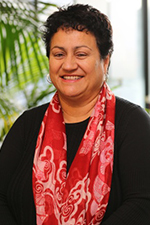 Arihia Bennett MNZM (Ngāi Tahu – Ngāi Tūāhuriri, Ngāti Waewae, Ngāti Porou) has been in the role of CEO since 2012. She is married to Richard and together they have a son Piri. She lives in Tuahiwi with three generations of whānau and is an active participant in her papatipu rūnanga. The wellbeing of tamariki, whānau and communities is the motivation behind Arihia’s long career in social services initially as a social worker, and a trainer/educator for Child Youth & Family and then as regional manager Te Waipounamu for Barnados NZ. In 2011, Arihia was appointed Chief Executive of He Oranga Pounamu, the iwi mandated organisation responsible for health and social services in Te Waipounamu. A passion for enabling and empowering whānau and communities to take control of their own lives, find their own voice and be the best they can be is a key driver for Arihia in her current role as she leads the organisation to develop the programmes and initiatives that will grow papatipu rūnanga and create a better tomorrow for Ngāi Tahu whānui. Arihia has held advisory positions to government, including Canterbury Earthquake Recovery Commissioner (CERC) following the September 2010 earthquake. She has also held governance roles within Te Rūnanga o Ngāi Tahu, including as a director for Ngāi Tahu Development Corporation from 1999-2002, and chair from 2002-2005. Other former Boards roles include Barnardos NZ and the Christchurch Women’s Refuge (now known as Aviva) . She is a current member of the Global Women’s Network and the Tuahiwi Māori Women’s Welfare League. The new position of Chief Operating Officer (COO) is a key role in the leadership team, helping to shape the collective Ngāi Tahu strategic vision and translate this into action. The COO provides leadership to the shared services, legal, communications, human resources and monitoring and compliance functions. 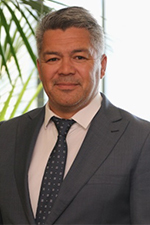 Julian Wilcox (Ngāpuhi) previously held the General Manager Communications role before being appointed as COO in February 2016. Julian worked for Māori Television for more than 10 years, in various roles, notably as General Manager, News and Current Affairs, where he managed a large team of staff providing strategic and operational leadership in a fast-paced environment. Julian has also had extensive involvement in Māori Radio, which has helped him to develop relationships with iwi, the Crown and Māori communities. While broadcasting has been a key focus of his career, Julian has also lectured in te reo, tikanga, whaikōrero and media. He is committed to Māori development and achieving whānau rangatiratanga, and has a passion for all things Māori. Te Taumatua is the pou responsible for ensuring the integration of Ngāi Tahutanga into all aspects of Te Rūnanga Group activities and ensuring the efficient and effective delivery of the core services through which tribal members can determine their membership, incorporating the whakapapa function, tribal archive and taonga collections, Kotahi Mano Kāika and the Ngāi Tahu Fund. As the General Manager, Te Taumatua, Lynne-Harata Te Aika (Ngāi Tahu, Ngāti Awa) is responsible for ensuring the intergenerational transfer of a strong, vibrant Ngāi Tahu culture through programmes such as Ngāi Tahu Funds, Kotahi Mano Kāika, Ngāi Tahu Archives and Whakapapa Ngāi Tahu. Before taking up her role with Te Rūnanga Lynne-Harata was the Senior Lecturer and Kaiārahi Māori, based at Aotahi School of Māori and Indigenous Studies, at the University of Canterbury. 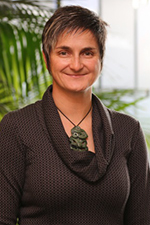 She is the former Head of School for Māori & Indigenous Studies in the College of Arts at the University of Canterbury, and the former Head of School – Māori, Social & Cultural Studies, at the College of Education, also at the University of Canterbury. Lynne has vast governance experience, including her former role as the Chair of Mātauraka Mahaanui, the Māori Advisory Board to the Minister of Education and Te Rūnanga o Ngāi Tahu for Greater Christchurch Educational Renewal. She has been a Ngāi Tahu Fund Board Member, a Christchurch Polytechnic Institute of Technology Council member, a Kotahi Mano Kāika Advisory Committee member and the Chair of Te Ngāi Tūāhuriri Education Committee. The Oranga pou is responsible for work streams designed to help whānau to realise rangatiratanga in the areas of education, employment, financial literacy and business creation. Oranga provides strategic programme delivery to ensure success for whānau through whānau rangatiratanga. Hana O’Regan (Kāti Rakiāmoa, Kāti Ruahikihiki, Kāi Tūāhuriri, Kāti Waewae) was previously the Kaiārahi – Director of Māori and Pasifika, and the Director of the Student Services Division at Ara Institute of Canterbury (Ara). In this role she sat within the Ara executive, reported directly to the CEO and oversaw 121 staff members. 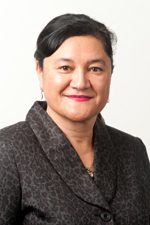 Hana has also held memberships to national commissions and boards, including the Government’s Working Party on Charter Schools, NZCER, The Review Panel for the Foreshore and Seabed Legislation, Ngā Kaituhono – The Māori Advisory Group to the NZQA Board, and the recent New Zealand Flag Consideration Panel, to name a few. She has strong capabilities in management, and in strategic planning and implementation. Hana’s expertise in te reo is recognised regionally, nationally and internationally. She has held memberships on numerous commissions, boards, advisory groups and committees, and strategy reference groups. She is a sought after public speaker and an award-winning lecturer, tutor and author. Te Ao Tūroa pou is responsible for our taonga resources, mahinga kai and natural environment. Te Ao Tūroa leads the strategic direction of these work streams and ensures the integration of programmes and environmental work streams within the wider tribal development strategy to support whānau outcomes. Kara Edwards (Ngāi Tahu – Te Rūnanga o Makaawhio, Wairewa Rūnanga) has been a passionate and effective advocate for Ngāi Tahu values in the management of our natural resources for over 20 years. She has been the Principal Ngāi Tahu Advisor to the Christchurch Earthquake Recovery Authority (CERA), and the Pou Tairangahau – Strategic Iwi Relationship Manager with the Department of Conservation. Kara was with the Department of Conservation from 2006 until 2015. 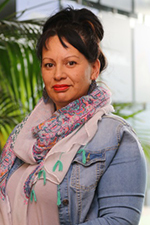 Kara is also a committed papatipu rūnanga member, chairing the Mahitahi Ahu Whenua Trust, the Taumaka me Pōpotai Ahu Whenua Trust, and she is the Deputy Chair of Te Rūnanga o Makaawhio. The Strategy & Influence pou is dedicated to realising our visions for tribal development through the development and implementation of political and organisational strategy, strategic relationship management and strategic public relations. This pou provides leadership in progressing the post-Treaty Settlement partnership between Ngāi Tahu and the Crown, as well as contributing to re-embedding Ngāi Tahu in the fabric of the community through key external relationships. It is focused on the protection of the rights of Ngāi Tahu, including those deriving from the Ngāi Tahu Claims Settlement Act, as well as maximising the contributions of Ngāi Tahu to the national interest. 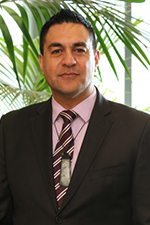 Rakihia Tau hails from Tuahiwi pā. He is married to Sonya Faisst and they have three young children, Rakiatea, Ana and Hamua. As a young man Rakihia watched and learned as the Waitangi Tribunal hearings unfolded at Tuahiwi. In the ensuing years he became deeply involved in The Claim process working as a researcher, participating on various sub-committees and ultimately taking a leadership role as one of the six Ngāi Tahu Claim negotiators. From 1998-2003 Rakihia worked for Ngāi Tahu Holdings in investments and the various subsidiaries. He then moved full time into Ngāi Tahu Tourism as a General and Divisional Manager of Shotover Jet until 2006. More recently, Rakihia was working as a partner in ARIHIA, a business consultancy. He has been involved in the Christchurch rebuild, helping establish Te Awheawhe Rū Whenua, then going on to work on a number of projects for the Canterbury Earthquake Recovery Authority (CERA). During his time at CERA, Rakihia played an integral role in the establishment of the Matapopore Charitable Trust, designed to ensure the realisation of Ngāi Tūāhuriri / Ngāi Tahu values, narratives and aspirations within the rebuild of central Christchurch.